Drink plenty of liquids: During hot spells, the body's cooling system can become overburdened. For this reason, you should drink more than usual to replace the fluids lost through perspiration. This can require three to four liters per day, preferably of still water. Unsweetened tea and diluted fruit juices are also recommended. You should take care only to drink when you are thirsty, and not to drink too much or too quickly. Otherwise, in the worst case, you might suffer from water intoxication! Avoid long car journeys if possible: Under the full heat of the sun, a car's interior can reach temperatures up to 70 degrees centigrade. Heat stress increases your heartbeat rate, and thus indirectly affects your reaction times. It can also result in symptoms of fatigue, and cause circulatory problems. For this reason, if you go on a car journey, you must ensure the car is well-ventilated, and that you take lots of short breaks, during which you can do light gymnastic exercises. You should also make sure you have enough water in reserve for longer traffic jams. Eat light meals: When high temperatures prevail, you usually instinctively lose your appetite for fatty and stodgy food, and large dishes. This makes salad and fruit more attractive. Make the most of your summer appetite and enjoy light healthy foods, and take the chance now to change your way of eating. Your body will be glad you did it – also because it can focus on its most important functions when under heat stress. Wear light and airy clothes: Wear white preferably, comfortable clothes during a heat wave. Everything which clings to the body will hinder the regulation of the body's temperature. Black clothing will add to the heat. Take care to choose natural fabrics like organic cotton – or especially breathable fabrics such as Dryfit or Coolmax. Out: tight-fitting cycling shorts. In: Bermuda shorts! Don't forget your sun hat: The rule that your head should not be exposed to the heat of the sun to avoid getting sunstroke, applies not only to children. 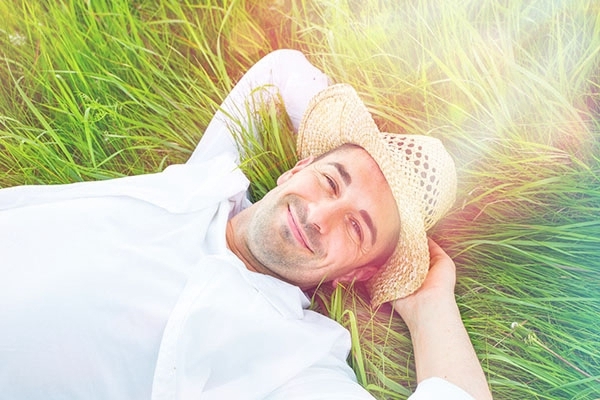 Prevent your brain from overheating by wearing a handsome summer hat or a cool baseball cap. Of course you can remove these when you are in the shade, which will then help to cool off your head. Don't go jogging in the burning sun: Re-schedule your outdoor fitness program to take place in the early hours of the morning, or the balmy summer evenings and nights. Select shady routes and adopt a moderate pace. Please note: While jogging, the body generates around ten times as much heat as normal, which can also lead to problems during hot spells. Don't overburden your heart: When you sweat a lot, the blood volume sinks, and your blood thickens, so that your heart has to pump more and work harder. Your body takes several days to adapt to these new conditions, therefore you should only take moderate exercise, especially at the beginning of a vacation in hot weather. Replace minerals: Due to increased perspiration during hot spells, your body not only loses fluids, it also loses valuable minerals such as magnesium and iron. This makes it vital not only to drink plenty of water, but also to replace this loss of minerals when required. Avoid coffee and alcohol especially at this time: Both of these have a diuretic effect, which can lead to additional loss of fluids. Don't forget to put on sunscreen lotion: Each incidence of sunburn increases the risk of skin cancer – this need not happen. It is better to stock up on vitamin D, using your outstretched palms. In general: Pay attention to your body during a heat wave! When your body tells you that you are thirsty, you should drink something. When your body signals fatigue, take a rest. When your body feels too hot, go into the shade. Otherwise you risk getting heatstroke or suffering a circulatory collapse. As always, we look forward with interest, to hearing your comments and would also be delighted if you share this article with your friends, relatives or acquaintances. A great way to recover from the heat is of course to visit one of our well air-conditioned clubs – and most of them also have an attractive pool. After all, there is nothing quite as refreshing as a cool dip in the water!